Rev. 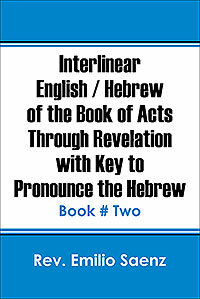 Emilio Saenz’s “Interlinear English / Hebrew of the Book of Acts Through Revelation with Key to Pronounce The Hebrew: Book #Two.” God inspired the idea to write these books to assist believers in learning the most probable Hebrew words of the New Testament books of Acts through Revation. It is my sincere hope that this book will bring you the desire to learn and speak Hebrew, the words spoken by our Lord Jesus Christ. Most of these words are the same as today’s Hebrew. For the glory of the Lord and His Son Jesus Christ. Amen. Previous Previous post: Vote now for the winner of the “Show Us Your Love” video contest and help us decide who will win a new laptop! Next Next post: Cook Up a Storm with this NEW One-Click Cookbook Publishing Package!